Charles Spurgeon preached his last sermon at the Metropolitan Tabernacle on this day in 1891. The so-called "Prince of Preachers" had preached at the Tabernacle for thirty years. 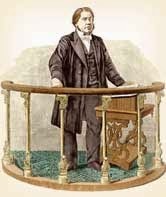 You can read an interested write up here and here is one site where you can access links to Spurgeon's sermons.